They then headed west via Cockermouth to industrial west Cumberland, travelling up the Irish Sea coast from Carlisle on their way to Scotland. Hobhouse's journal of the tour includes accounts of their excursions to view the splendours of the Lake District - including boat trips on Derwent Water and Ullswater and an ascent of Skiddaw - but it also contains descriptions of the industrial 'curiosities' of the west Cumberland coalfield, the highlight of which was a subterranean tour of the colliery at Whitehaven. Hobhouse's interests were wide-ranging and he comments throughout not only on aesthetics but also on geology, farming and industry of all types. In Carlisle, Henry Hobhouse found that: “The cathedral is a very mutilated irregular building & dirty to outside view; but it is somewhat more seemly within.” He admired the east window, which he described as “very neatly ramified in its tracery”, but he regretted that it was not in the centre of the church. He remarked that Carlisle was “decently built”, but the city walls were “very indecently kept”. The parish church, St Cuthbert’s, was “a mean building”. The church was demolished and replaced with the present fine building a few years after Hobhouse’s visit. At Whitehaven, they went into the coal mines. “We were arrayed in colliers dresses & our guide preceded us with his lighted rope.” They descended the mine until they were “110 fathoms below high water mark, beyond low water mark perpendicularly under the sea.” Hobhouse was fascinated by the pumps used to drain the mines. He was also taken with the steel mill, invented by the mine engineer Carlisle Spedding. This was a device which gave light without the danger of an explosion from the fire damp. Sparks were emitted from a flint which was struck by steel wheels and gave sufficient light to illuminate the mine. The colour of the sparks changed according to the density of the fire damp. Henry Hobhouse’s curiosity make his a particularly interesting account of what was becoming a fairly common tourist trail. The 32-year-old barrister and his friend, John Jenkyns, accompaied by their groom, Thomas Porch, had set out from London on 24th June, 1774, and arrived in Bristol four months later on 23rd October. They spent the journey in pursuit of “objects of curiosity and attention”. Their route took then through East Anglia and into Scotland. During the ten days they spent in Cumbria, the trio visited Kendal, Windermere, Ambleside and Keswick. At Keswick they explored Derwentwater and made a detour to visit Penrith and Ullswater. Their route took them to Whitehaven and then along the coast through Workington, Maryport and Allonby before they headed across the Solway Plain to Wigton, where they stayed the night before going to Carlisle. 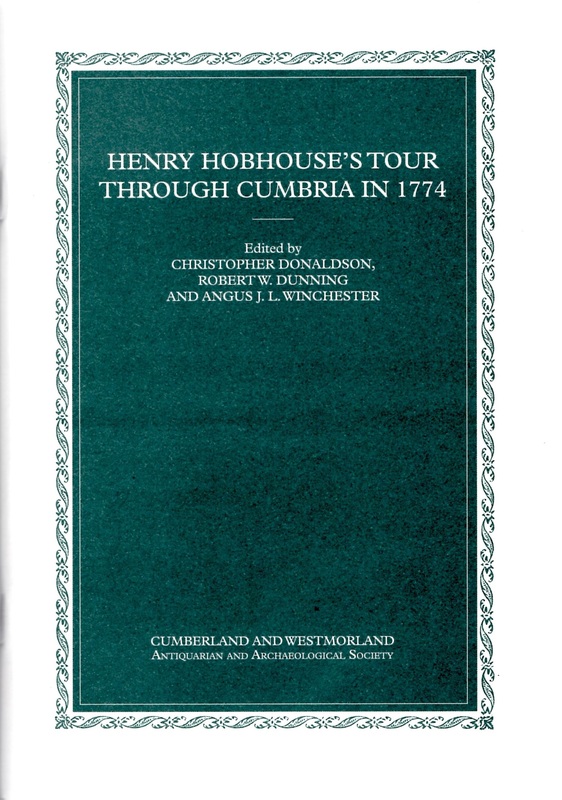 The Cumbrian section of Henry Hobhouse’s travel journal is here published for the first time. Together with the detailed notes and the scholarly introduction from the editors, the journal offers a rich picture of the Cumbria of the time. It is a very welcome addition to the tourist literature of the period.